Saut Situmorang (*29 June 1966, Tebing Tinggi, North Sumatera, Indonesia) was raised in Medan. He spent eleven years (1989-2000) as an immigrant in New Zealand, where he did his BA in English Literature, and MA in Indonesian Literature, and was actively involved in underground poetry readings. 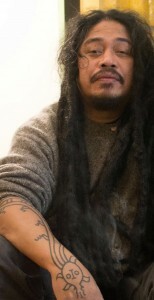 For his English-language poetry he received the Original Composition Prize from Victoria University of Wellington, and the Blues Award from the University of Auckland. He returned to Indonesia in 2000. He now lives in the city of Yogyakarta, where he works as a full-time writer. He has published several books of poems, saut kecil bicara dengan tuhan (2003), catatan subversif (2004), otobiografi (2007) and Les mots cette souffrance (Collection du Banian, Paris, 2012), as well as a book of literary essays. His Indonesian-language poems and short stories have been translated into English, Italian, Czech, French, and German. Situmorang has been a pioneer of internet literature in Indonesia. At present he is editor of the Indonesian underground literary journal boemipoetra. Between 2005-07 he was the literature curator for the Festival Kesenian Yogyakarta (Yogyakarta Arts Festival). In 2012 he was curator for the International Poetry Festival Indonesia What Is Poetry?. He took part in many international literary festivals such as What is Poetry? in South Africa, and Zimbabwe, and Poetry On The Road in Bremen, Germany. Listen to recordings of his poetry readings here. Thanks to Regina Dyck, Poetry on the Road.